The Fair Debt Collection Practices Act (FDCPA) outlaws the use of false representations or deceptive means to collect consumer debts. The statute also prohibits collectors from using unfair or unconscionable practices in debt collection. Almost 20 years ago, the Supreme Court determined that consumer debt collection attorneys involved in litigation activities were subject to the FDCPA. In the aftermath of the Supreme Court’s ruling, courts have imposed liability on attorneys based on alleged false or misleading statements in court pleadings. Lawyers have faced liability in a number of cases of case including circumstances where a lawyer signed an affidavit in a bank garnishment filing averring that the debtor’s bank account contained non-exempt funds, statements in a motion for summary judgment allegedly falsely asserting the amount of the debt  and statements in request for admissions in pre-trial discovery served on a pro se debtor that did not explain that a response was required within thirty (30) days to prevent the requests from being deemed admitted. The so-called “robo-signing” scandal that emerged as a result of the recent foreclosure crisis, where employees of mortgage companies and foreclosure agents were alleged to have signed documents without reviewing them, was the basis of a Maryland FDCPA class action suit by debtors named in residential foreclosure suits. The attorney/FDCPA defendant filed court documents required to initiate foreclosure proceedings but instead of personally signing affidavits attached to the court filings, had clerical employees of the firm sign the name of the attorney. 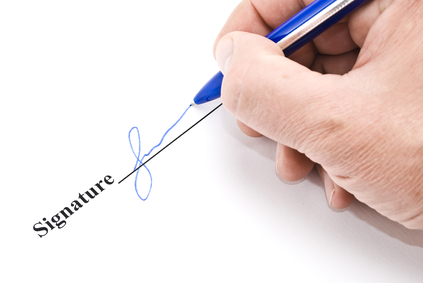 A notary also attested that the documents were personally signed by the attorney when in fact the lawyer did not sign the papers. When the homeowners discovered that the foreclosure filings included falsely executed signatures, they sued under the FDCPA asserting that the attorney made false statements in connection with the collection of the debt and that the practice of having an employee sign the attorney’s name to the notarized documents operated as an unfair or an unconscionable debt collection practice. The trial court dismissed the consumer’s FDCPA claims, holding that the alleged misrepresentations were not material because the homeowners/debtors did not deny the debt giving rise to the foreclosure action. The homeowners then appealed the decision. The United States Court of Appeals for the Fourth Circuit affirmed the dismissal of this suit. The Court acknowledged that its earlier decision  had adopted the “materiality” standard, explaining that “a false statement that would not mislead ‘the least sophisticated consumer’ is not actionable.”  The Fourth Circuit also cited decisions of three other Federal Circuit Courts adopting the materiality standard to FDCPA lawsuits alleging false, misleading or deceptive statements in connection with the collection of a debt. The Court cautioned that it did not “look favorably upon improper behavior by attorneys”  but determined that because the homeowners were unquestionably in default and did not deny the existence of the debt, that the fact that another person signed the attorney’s name under affidavit did not impose liability under the FDCPA. Heintz v. Jenkins, 514 U.S. 291 (1995). McCollough v. Johnson, Rodenburg & Lauinger, LLC, 637 F.3d 939 (9th Cir. 2011). Lembach v. Bierman, 2013 WL 2501752 (4th Cir., June 12, 2013). Warren v. Sessoms & Rogers, P.A., 676 F.3d 365 (4th Cir. 2012). Lembach v. Bierman, supra at *5. Donohue v. Quick Collect, Inc., 592 F.3d 127 (9th Cir. 2010), Hahn v. Triumph Partnerships, LLC, 557 F.3d 775 (7th Cir. 2009) and Miller v. Javitch, Block & Rathbone, 561 F.3d 588 (6th Cir. 2009).